Take your putting to the next level with the brand new deluxe Putting Mat from PuttOUT. 40% of all shots on the course are made with the putter - Up your training with putt repetition practice to reduce your number of putts and see dramatic improvements to your overall score. Consistency is created by practice! 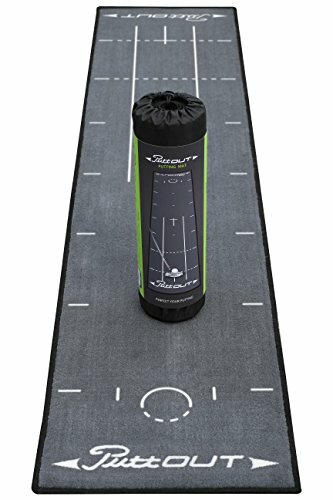 For any golfer a home putting set-up is an essential training tool, and the PuttOUT Putting Mat makes practice enjoyable, effective and easy to fit into your day wherever you are. Constructed with a durable, heavy-rubber backing to allow the mat to lie smooth and flat on any surface, easily roll the mat away and into the compact carry bag for practice on the go. The high quality cut-pile surface is designed to accurately replicate a medium-to-fast green, with a stimpmeter reading of 10. You'll love the printed alignment guides, target points and distance markings which allow you to practice with just a putter and a ball. Use the instructional markings and 5 included drills to help develop your game and improve your confidence when putting under pressure. The putting mat is compatible with any flat putting cup, but for best results use with the revolutionary PuttOUT Pressure Putt Trainer for the ultimate putting practice set-up. If you have any questions about this product by PuttOut, contact us by completing and submitting the form below. If you are looking for a specif part number, please include it with your message.